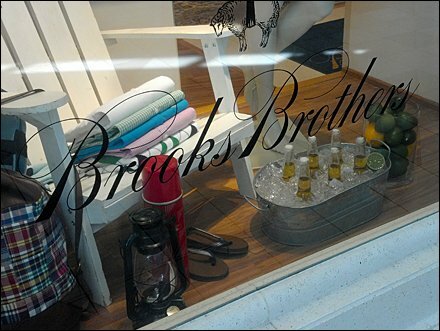 Iced Corona and Lime promote hot weather fashions at Brooks Brothers. Does the display put you in a vacation and casual fashions mood? CLICK the thumbnail for a closer look. Not being a drinker I can’t explain the single lemon amid the limes. 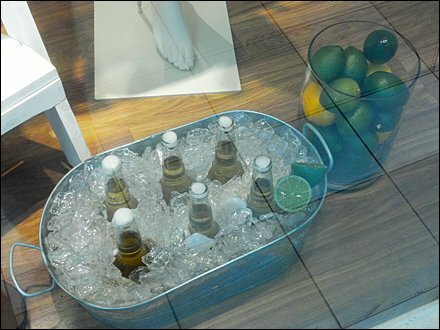 Is there a sub cult of Corona drinkers, or was Visual Merchandising adding a splash of color. I also wonder if part of the display rationale is to keep the staff happy consuming it at day’s end and restocking fresh on the ‘morrow?